Pakistan’s supreme court has upheld Asia Bibi’s acquittal. 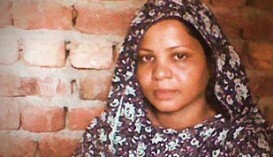 Asia Bibi was sentenced to death for blasphemy, clearing the last legal hurdle and freeing Asia Bibi to leave the country. The three-judge panel of the country’s Supreme Court on Tuesday said the arguments of the lawyer acting on behalf of the petitioners did not satisfy the judges. Radical Islamists had demanded the court reverse its Oct. 31 acquittal and execute Bibi. Bibi, who spent eight years on death row and remained under house arrest at a secret place since her acquittal, is now free and allowed to leave the country and join her daughters who’ve fled to Canada and were granted asylum there.